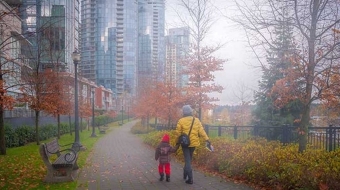 Soaker hoses are very convenient, but under Vancouver’s current stage 3 watering restrictions, they’re banned. Photo by Rebecca Cuttler. As of July 20, Stage 3 watering restrictions are in effect across Vancouver. I should have been prepared for this news. It’s been predicted for a while. But it was still hard to take. During this year’s previous Stage 1 and 2 restrictions, vegetable gardens did not face any constraints. Now, at Stage 3, only watering cans, drip irrigation and hoses with spring-loaded nozzles are allowed. Earlier this summer, we started to build an irrigation system with automatic timers. This system has made our watering routine much more efficient. There’s just one problem: drip-line was sold out everywhere we looked, so we purchased soaker hose lines for the time-being. Under the new restrictions, these are banned. I’m now asking myself some hard questions about our water use on the backyard farm, and figuring out how to adapt. Be sure to water the soil, not your plants’ leaves. Photo by Rebecca Cuttler. Use good hot-weather gardening practices: water in the morning and mulch, mulch, mulch. Of all the things we did this year in the garden, I’m most glad that we spread a thick layer of straw and compost mulch around many of our plants. By reducing evaporation, mulch can significantly reduce watering needs. Water the soil, NOT the leaves. The goal is to provide moisture to your plants’ roots, deep within the soil. 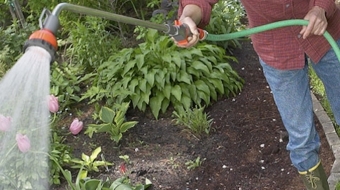 Get your watering can as close to the ground as possible, or install true drip irrigation.